The meaning of 'Raksha Bandhan' is 'a bond of protection'. It is a celebration of relationship - that of a brother and a sister. This relationship is no where so celebrated as in India. It is a day when siblings pray for each others' well being and wish for each other’s happiness and goodwill. On this auspicious day, brothers make a promise to their sisters to protect them from all harms and troubles and the sisters pray to God to protect their brother from all evil. Sisters tie the silk thread called Rakhi on their brother's wrist and pray for their well being and brothers promise to take care of their sisters. The festival falls on the Shravan Purnima which comes generally in the month of August. This year it falls on 2nd August. 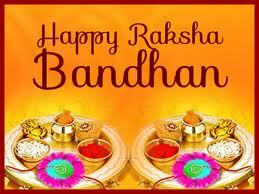 Raksha Bandhan is also called Rakhi Purnima in most of India. It is also celebrated in some parts of Pakistan. The festival is observed by Hindus, Sikhs and some Muslims. Raksha Bandhan is now considered as a day to celebrate the sacred relation of a brother and a sister. Yet there have been examples in history where in rakhi has just been a raksha or protection. It could be tied by wife, a daughter or mother. The Rishis tied rakhi to the people who came seeking their blessings. The sages tied the sacred thread to themselves to safe guard them from the evil. It is by all means the 'Papa Todak, Punya Pradayak Parva' or the day that bestows boons and end all sins as it is mentioned in the scriptures. Some people tie Rakhi to neighbours and close friends signifying a peaceful co-existence of every individual. Rakhi Utsav was first popularized by Rabindranath Tagore to promote the feeling of unity and a commitment to all members of society to protect each other and encourage a harmonious Social life. Jai Santoshi Maa. Ganesh had two sons, Shubh and Labh. On Raksha Bandhan, Ganesh's sister visited and tied a rakhi on Ganesh's wrist. Feeling and his two wives, Riddhi and Siddhi, for a sister. Finally, Ganesh conceded the demand, and Santoshi Ma (literally the Mother Goddess of Satisfaction) was created by divine flames that emerged from Riddhi and Siddhi. Another incident from the epic Mahabharat concerns Krishna and Draupadi, the wife of the Pandavas. She had once torn a strip of silk off her sari and tied it around Krishna's wrist to staunch the bleeding from a battlefield wound. Krishna was touched by her action and declared her to be his sister, even though they were unrelated. He promised to repay the debt and then spent the next 25 years doing just that. Draupadi, in spite of being married to five great warriors and being a daughter of a powerful monarch, trusted and depended wholly on Krishna. Krishna repaid the debt of love during the "Cheer-Haran" (literally "clothing-removing") of Draupadi, which occurred in the assembly of King Dhritarashtra when Yudhisthira lost her to the Kauravas in gambling. At that time, Krishna indefinitely extended her saree through divine intervention, so it could not be removed, to save her honor. This is how he honored his rakhi vow towards Draupadi. According to a legend the Demon King Bali was a great devotee of Lord Vishnu. Lord Vishnu had taken up the task to guard his kingdom leaving his own abode in Vaikunth. Goddess Lakshmi wished to be with her lord back in her abode. She went to Bali disguised as a woman to seek refuge till her husband came back. During the Shravan Purnima celebrations, Lakshmi tied the sacred thread to the King. Upon being asked, she revealed who she was and why she was there. The king was touched by her goodwill for his family and her purpose and requested the Lord to accompany her. He sacrificed all he had for the Lord and his devoted wife. Thus devotion to the Lord. It is said that since then it has been a tradition to invite sisters in Shravan Purnima for the thread tying ceremony or the Raksha Bandhan. According to another legend, Raksha Bandhan was a ritual followed by Lord Yama (the Lord of Death) and his sister Yamuna, (the river in northern India). Yamuna tied rakhi to Yama and bestowed immortality. Yama was so moved by the serenity of the occasion that he declared that whoever gets a rakhi tied from his sister and promised her protection, will become immortal. According to one legendary narrative, when Alexander the Great invaded India in 326 BC, Roxana (or Roshanak, his wife) sent a sacred thread to Porus, asking him not to harm her husband in battle. In accordance with tradition, Porus, a Katoch king, gave full respect to the rakhi. On the battlefield, when Porus was about to deliver a final blow to Alexander, he saw the rakhi on his own wrist and restrained himself from attacking Alexander personally. A popular narrative that is centered around Rakhi is that of Rani Karnavati of Chittor and Mughal Emperor Humayun, which dates to 1535 CE. When Rani Karnavati, the widowed queen of the king of Chittor, realised that she could not defend against the invasion by the Sultan of Gujarat, Bahadur Shah, she sent a Rakhi to Emperor Humayun. Touched, the Emperor immediately set off with his troops to defend Chittor. Humayun arrived too late, and Bahadur Shah managed to sack the Rani's fortress. Karnavati, along with a reported 13,000 other women in the fortress, carried out Jauhar on March 8, 1535, killing themselves to avoid dishonor while the men threw the gates open and rode out on a suicidal charge against Bahadur Shah's troops. When he reached Chittor, Humayun evicted Bahadur Shah from fort and restored the kingdom to Karnavati's son, Vikramjit Singh. Although contemporary commentators and memoirs do not mention the Rakhi episode and some historians have expressed skepticism about it, it is mentioned in one mid-seventeenth century Rajasthani account.